There is a vital shift happening in the business world: a growing class of savvy, empowered consumers are demanding more options, fairer prices, and better interactions across the entire customer journey. As a result, businesses across a wide range of industries are being compelled to adopt a more customer-centric approach. It’s no longer just about product, or pricing, or promotions, or place. In order to differentiate themselves from the competition and drive revenue growth, businesses must delight customers, exceed expectations, foster consumer trust and loyalty, and deliver experiences that customers love. None of this will happen without teamwork, though. Customer experience management is an executive decision and requires an organization-wide commitment. To inspire your leaders and the rest of your team — from the C-suite to the frontline — we gathered a list of customer experience quotes (and other bits of wisdom) for you to think about and maybe even hang in your office. Enjoy! Some businesses are too focused on making the sale, but don’t pay nearly enough attention to satisfying customers’ wants and needs. To truly drive growth, manage the entire customer experience and offer next-level support — including at touchpoints after the purchase or sales transaction. 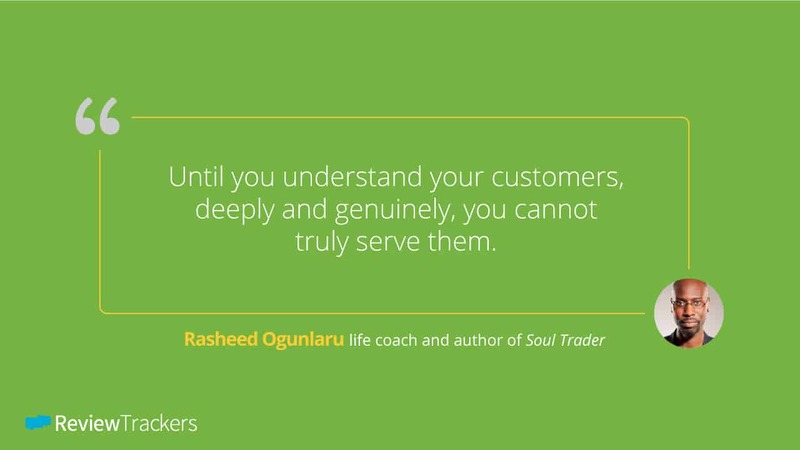 The customer experience isn’t just about the way you develop your products and deliver your services; it’s also about the way you treat your customers. If your frontline employees are unkind, uncaring, and unresponsive, there is no way customers will engage with your business beyond the initial interaction. Treating customers right, on the other hand, helps drive loyalty and engender positive word of mouth. Now more than ever, consumers rate and judge businesses not by the quality or price of their products and services, but by the experience the business builds around these products and services. Once your entire organization understands and acts on this, you’ll be in a great position to attract customers and keep them coming back. 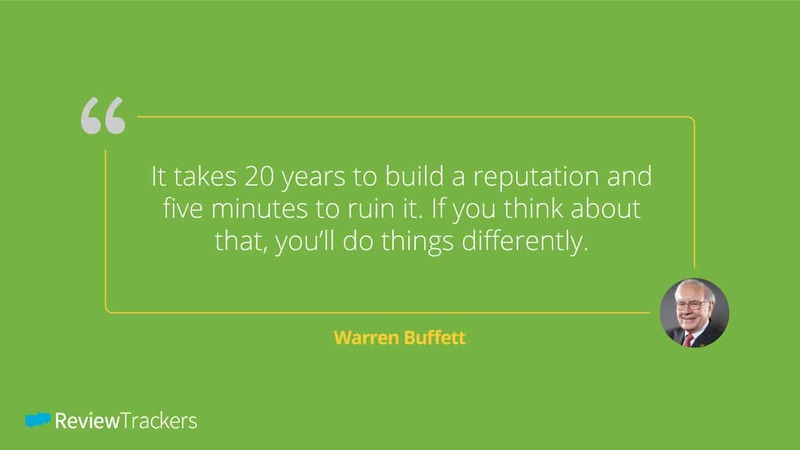 This quotes captures the essence of how, in today’s age, user-generated content (such as online reviews, blog posts, and social media comments) can make or break a business. With consumers no longer reliant on branded content to guide their purchase decisions, you must monitor, respond to, and stay on top of customer feedback — and find ways to engage positively in conversations where your brand reputation is on the line. Many businesses develop their marketing strategies around ways they can push branded content, sales messages, and self-promotional missives to consumers. But successful customer experience management is founded on a company’s ability to listen. Don’t allow your brand to become just a loudmouth. 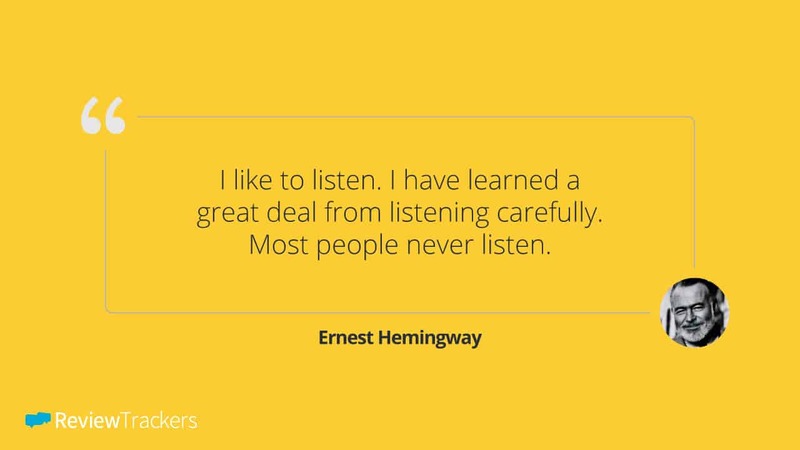 Take it from Hemingway: listen to the voice of your customers. You’ll be surprised by the quality and value of insights they have to share with your business. Whenever your business receives negative reviews, one-star ratings, and comments from harsh online critics, it’s tempting to want to fight back, or censor customer feedback, or disregard entirely what detractors are saying. 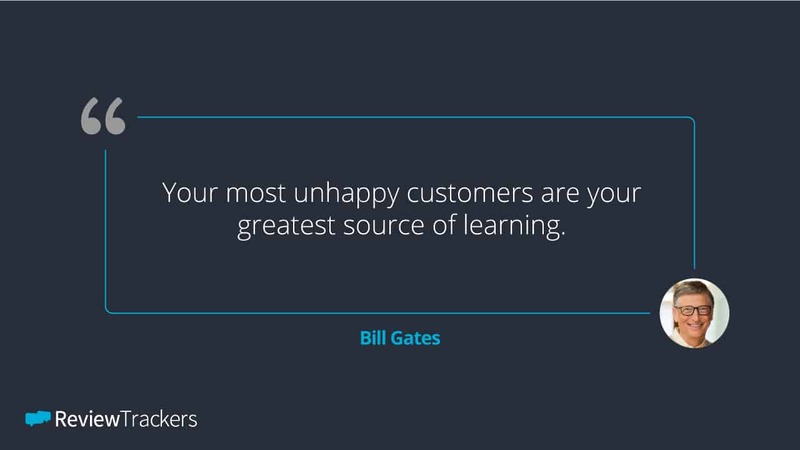 Successful customer-centric companies, however, do the exact opposite. They consider negative feedback as valuable information, and they listen carefully to their most unhappy customers in order to better understand and improve the customer experience. This one takes the Bill Gates quote further — by encouraging companies to show gratitude to and appreciation for customers who complain. Don’t save all your love for just the people who write 5-star reviews of your business. Customers who leave any kind of feedback should be acknowledged individually and addressed personally, so make them feel important. At the very least, say thank you — even (or especially) when customers don’t exactly have great things to say about their experience. As the above quote suggests, selective responsiveness isn’t really responsiveness. In today’s multi-channel landscape, businesses that succeed and businesses that don’t will be separated by their ability to engage with and respond to customer-driven conversations — wherever these conversations are taking place. You cannot effectively manage and optimize the customer experience without first achieving a complete, accurate understanding of your customers. What do they really want? How do they really feel? What do they really think of your products and services? There are various methods by which you can deeply and genuinely understand customers, like monitoring online reviews and social media, staying on top of key customer touchpoints, analyzing customer feedback, collecting customer data, distributing customer feedback surveys, and so on. Only when you know your customers inside-out will you be able to captivate and delight them. Data without insights won’t be of much use to your organization. Neither will insights without action. After you analyze customer feedback and discover high-impact issues and trends affecting the customer experience, it’s time to create an action plan. Use what you find to foster operational and service improvements, and harness valuable feedback to create amazing customer experiences. 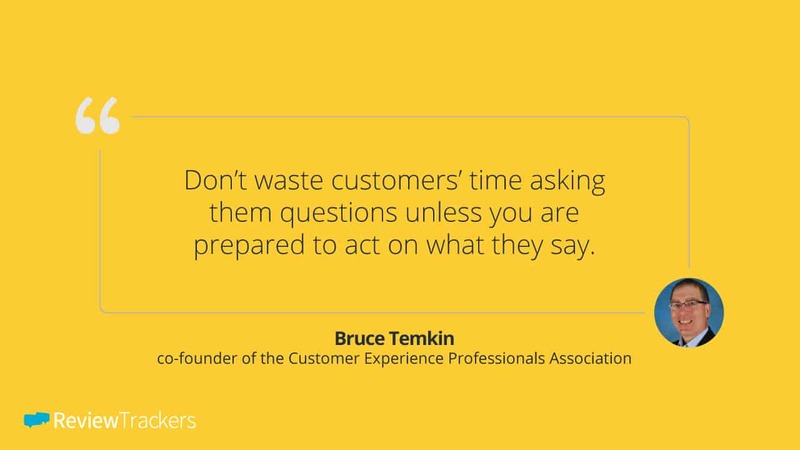 Do you know other inspiring customer experience quotes? Feel free to add to this list by leaving a comment below.